Measures 25"H x 14"W x 3-1/4"D. Plans drawn FULL SIZE. 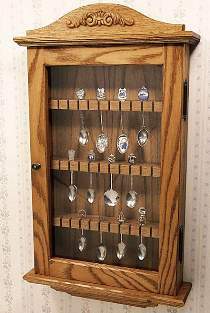 The three different shelf designs included in the plan will allow you to display not only spoons, but golf balls, thimbles, crystal, etc. Order hardware package separately below. Display Cabinet Hardware Package Hardware package contains one pair of non-mortise hinges with mounting screws, knob, and magnetic catch. Project plan, embossed wood ornament, glass, hangers, wood and wood finish are not included.